Industry professionals offer advice on how to manage dual paper/electronic systems. Hybrid medical record environments have been around for as long as many HIM professionals can remember, and most believe they are here to stay for the foreseeable future. In fact, the push toward EMR adoption and other advanced HIT environments has only exacerbated the situation as organizations strive to meet meaningful use (MU) deadlines. Defined by the industry as a combination of maintaining records through both electronic and paper-based means, hybrid medical records, notes Kohn, can best be described as information pertinent to a particular patient maintained via different mediums: transcribed data, scanned images, paper, DICOM (Digital Imaging and Communications in Medicine), and other forms of electronic media. Many types of hybrid environments can be found in hospitals. Typical formats include a combination of an EMR and paper or an EMR alongside some type of imaging. Melissa King, manager of information management solutions with Standard Register Healthcare, points out that nowadays there is less paper within the always evolving hybrid environment as healthcare organizations attempt to move paper into an electronic environment. One of the greatest challenges of managing a hybrid system is not having the correct documentation to “marry the information into a patient record” to achieve a complete picture of care, she notes. It’s certainly a challenge at two hospitals within the Illinois-based Provena Health system—356-bed Provena Mercy Medical Center and Provena Saint Joseph Hospital—where the legal department regards the paper-based version as the legal record. Joe expects the situation to remain at a standstill until all systems can be tweaked to integrate into the EMR. Currently, the Provena hospitals are working on deploying scanning systems. “When you have a scanning solution interfaced with the EHR, then we will be able to get all the information into the electronic system,” Joe says. The hospitals are in the process of reviewing various vendor document management and scanning solutions. Joe notes that it has been challenging to find technology that will make electronic capture a reality. “Many vendors say that their products will interface, but that’s not always the case,” she explains. Until then, the hospitals will continue to print out all files postdischarge because patient information gaps exist in the electronic version. Joe says there will always be some documents that won’t interface directly, making it imperative to deploy scanning systems that integrate into an EMR going forward. These documents could encompass state forms or information provided from outside providers. “You will have to scan those in to become part of the overall medical record,” she says. Kohn points out that many hospitals can become overwhelmed when considering all that needs to be done to pull the full patient record off the paper chart and put it into an EMR. To get started, she suggests prioritizing and focusing on key areas. Paper-based processes require various procedures and steps to ensure an event occurs, Kohn further explains, adding that in a digital environment, the processes have to be reworked and reinvented. Typical priorities currently revolve around MU requirements such as computerized physician order entry and e-prescribing. “MU is directing this. Quality reporting will be a priority,” Kohn says. When considering the many formats in which information is stored, King notes that hybrid medical record environments have to be well managed to ensure documentation does not get misplaced. “Misplaced documentation can lead to legal risks,” she says. • patient accounting and billing. A bar code is a representation of data that can be read by an electronic device. The use of this technology has proven successful in creating efficiencies and improving productivity and accuracy in various industries. In a nutshell, the technology provides a fast, accurate method for entering data, making it effective for managing hybrid medical environments. According to HIMSS, bar coding should be part of a greater electronic document management system (EDMS) strategy that allows migration to a digital format from existing analog and manual output and processes. HIMSS states the overriding goal of this system is to manage paper efficiently, not necessarily eliminate it. “HIM departments have reached a point where automated solutions are becoming a necessity to overcoming the difficulties of managing so much paper,” King says. • Automatically fax analog or digital documents in the event only a fax machine is at the receiving end. Similarly, these systems must have the ability to automatically capture and index faxed-in documents. • Automatically consolidate the storage, access, management, and distribution of digital source documents (EMR technology). • Electronically assign, route, and activate an organization’s business operations and decision processes through system-controlled rules (workflow technology). • Electronically assemble a group of documents, such as medical administration records, control the versions, and secure the documents (document management technology). • Electronically validate the authenticity of any individual transmitting information and ensure the security of that information (digital signature management technology). • Electronically create, deliver, and customize document content across the enterprise (document content management technology). • Electronically file by type, legal use, and date to obey important file retention/destruction requirements. This avoids any physical handling and permits quick implementation of HIPAA-based file retention policies and procedures (records management technology). According to Kohn, the relationship between IT and HIM is paramount to success as the hybrid medical record environment continues to evolve, especially as IT professionals try to build systems and processes that bring patient information into the EMR. Swimming in a sea of challenges, HIM and IT professionals realize that hybrid record environments will have to exist for some time to come. There is simply no way to wait until all the puzzle pieces fit neatly into a fully integrated EMR. In that light, experts agree that one of the most important steps that can be taken to ensure hybrid environments operate effectively and efficiently is to implement a strong core of policies and procedures. “Often policies will take a backseat,” Kohn says, adding that at the very least, hospitals should implement policies and procedures for handling documents on an internal level as well as for those received from external sources. King suggests that before venturing into a hybrid medical record situation, hospitals and providers get organized with bar-coded systems. That way, policies and procedures can be built around the system to ensure HIM doesn’t have to accept outdated documents or forms that don’t line up with the technology. “This process can ensure that the transition to an EHR will be a lot more successful,” she points out, adding that rules about what HIM can accept need to be fine-tuned to ensure only standardized documents are entered into the system. Policies to cover downtime due to network issues or disaster recovery should also be considered, King adds. “I talk to [chief information officers] all over the U.S. If [computerized physician order entry] goes down, they are reverting back to paper,” she explains, adding that in such situations there should be rules for capturing patient information, bar coding it, and getting it back into the electronic system. Joe points out that policies concerning how release of information is handled are an important component to ensuring that healthcare organizations are correctly following protocol for releasing a legal medical record. Plus, when a complete record is requested, the process of compiling that data becomes complicated, time consuming, and costly. 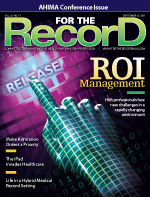 One area King sees as particularly challenging moving forward is managing informed consent in the legal medical record. She notes there are EMR modules for numerous functions but few address informed consent. “This is a process that has to be followed,” she says. Policies and procedures regarding how physicians approach their transcription and documentation also have to be tweaked and fine-tuned to fit into the hybrid process of moving paper documentation into the EMR, Joe notes.